Bus from Teluk Intan to Johor Bahru is second most demanding bus service in Teluk Intan Bus Terminal after Teluk Intan to KL. Many of them who take the bus are either working in Singapore or Johor Bahru. 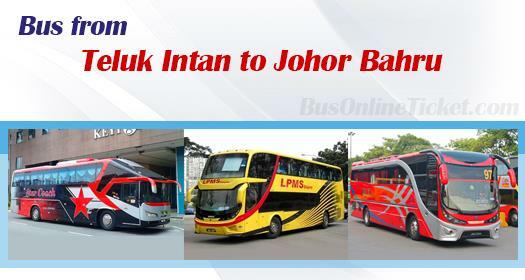 Starcoach, LPMS, Maju Express are the three coach companies providing bus from Teluk Intan to Johor Bahru. All of their coach fleet are the spacious 3-seat-a-row VIP coach to ensure passengers having comfortable 8-hour journey. In the past, residents from Sabak Bernam, Simpang Empat, Sungai Besar are required to travel to Teluk Intan to take this bus service from Teluk Intan to Johor Bahru. Thing has changed after LPMS launching the new bus route service. LPMS bus service departs from Teluk Intan Bus Terminal, then the coach will passby Sabak Bernam, Simpang Empat, Sungai Besar and Sekinchan to pick up passengers before taking the highway to Johor Bahru. Hence, LPMS direct bus service from Sabak Bernam, Simpang Empat, Sungai Besar to Johor Bahru offers the convenience to residents from those areas. The journey duration from Teluk Intan to Johor Bahru takes about 8 hours depending on traffic condition. At least 1 stopover would be provided for passenger to have washroom break. The bus fare for bus from Teluk Intan to Johor Bahru is in the range of RM 52.70 – RM 57.20. The same bus fare applies to Sabak Bernam, Simpang Empat, Sungai Besar to Johor Bahru. Upon arrival in Johor Bahru, passengers could request the driver for drop off at the main road at Skudai, Tun Aminah before terminating at Johor Bahru Larkin Bus Terminal. Booking your Teluk Intan to Johor Bahru bus ticket online with BusOnlineTicket.com is more convenient as compared to purchasing ticket over the Teluk Intan Bus Terminal. Besides that, bus is filling fast especially on Sunday when everyone is going back to Johor Bahru to prepare for work next day. By booking online, passengers could secure the bus ticket before the journey.